October 29 has been an exceptional day in the history of the Kingdom of Cambodia since it was the day of the coronation of the new King HIS MAJESTY NORODOM SIHAMONI who succeeds his father NORODOM SIHANOUK, the beloved FATHER of our nation, highly respected by his children, grand-children and great-grand-children. On the occasion of the Holy Royal Ceremonies that took place this day we observed all the high rank officials from the Cambodian government presided by Prime Minister HUN SEN and followed by the President of the National Assembly Prince NORODOM RANNARITH, the president of the Senate Chea Sim, the opposition leader Sam Rainsy and the government ministries. Ambassadors and representatives from many countries of the world and leaders of the religions present in the Kingdom came to witness the coronation of His Majesty Norodom Sihamoni and to wish him and our country a long life of prosperity and progress. His Majesty N. Sihamoni said in his first speech as our new King: “From this happy and solemn day on, I shall devote my whole self in body and soul to the service of our people and nation, pursuing the exceptional work accomplished by my august Father. I shall endeavor myself to continue the path of our glorious and ancient past”. 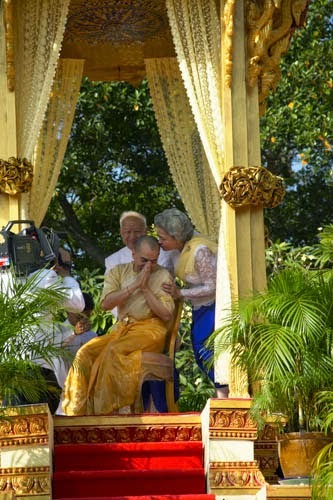 The new King continued: “I engage myself with confidence at the service of religion, humanity, education, social assistance and to the well being of every Cambodian and in particular in favor of the rural population of our Kingdom”. Addressing the international community His Majesty N. Sihamoni said: “I request each of you to continue the efforts you have already accomplished in favour of the Buddhist Faith, in favor of the development of the country and the construction of peace, prosperity and the honor of our country”. At the end of his speech the new King wished that the Kingdom of Cambodia may enjoy solidarity, national union and the benefit of political decisions. To all his beloved compatriots His Majesty wished good health, happiness and prosperity in recompense to the efforts made in their daily lives. The King gave his special greeting to all the Ambassadors and representatives of different nations for their presence and for their love for Cambodia. Prince N. Ranarith said to reporters that “the first plan the new King has in mind is to visit our whole country. Then he will visit Asian countries”. Prince Ranarith said that after the Roya Ceremony of the Holy Water, ‘Srong Preah Sokunvary’ his was very happy.